Editor’s Note: In this installment of Valuation Issues and Answers, Lifflander, ASA,explains how to handle foreclosures and short sales when choosing comparables. Question: Please explain the difference between an actual foreclosure sale and a short sale. Should short sales be used as comparables? – M.S. Answer: A true foreclosure sale represents one extreme on the continuum of sales that include an element of duress. In many locations, foreclosure sales are auctioned off “on the courthouse steps.” Buyers of these types of properties usually are required to pay the purchase price in full with a cashiers’ check as soon as the bidding is over. Bidders will have conducted research to make certain they are bidding on a first trust deed and not a second. They often have not entered the property to ascertain its condition. Because some owners have been known to vandalize their homes before they are forced to relinquish them through foreclosure proceedings, foreclosure-sale buyers account for this risk and generally bid quite low. Sales of this type would almost never be used to determine market value and they are generally not in multiple listing services. On the other end of the spectrum are short sales which have become more common in recent years. Strictly speaking, short sales are not foreclosure sales but they do involve some duress. With short sales, the owner is typically behind on the payments and often owes more on the home than it is worth. This condition is often referred to as being “upside down” in the property. The lender, hoping to avoid the expense and time of foreclosure, allows the owner to list the property with a real estate agent, with the condition that the lender will approve the sale price. Depending on the terms of the agreement, the owner may be relieved of the obligation to pay for the loss if the property cannot be sold for the full amount of the outstanding mortgage. Or, the agreement may leave the owner open to a deficiency judgment, which would require payment of the difference between the sale price and the mortgage amount if the lender elects to sue to try to collect in court. Lenders prefer short sales because they save the time and expense of a foreclosure, and because homeowners are often cooperative and do not damage the property since they have a vested interest in the sale price. Short sales are listed in the local multiple listing service (MLS) just like any other property, so unlike foreclosures, they are not limited to a certain type of buyer. While it’s true that there is an element of duress involved in a short sale, if there are numerous short-sale properties available in an area there is a good chance that potential buyers will opt to purchase them over conventional listings to save money. Eventually, homeowners selling for the typical reasons will have to lower prices to compete. In this way, short sales may become the predictor of where the market is going. Appraisers in areas where short sales make up a large portion of sales often find that they must use them as comparable sales to determine market value. If you are in such an area, I would caution you about ignoring short sales without a disclaimer explaining why they were not used. Otherwise, if the subject property sells for less than the appraised amount in the future, you may find yourself with liability for their omission. Please send your questions to john@liffland.com. 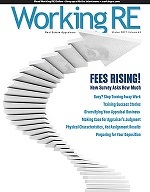 Find regular installments of Valuation Issues and Answers in the WRE online edition, reaching 45,000 appraisers via email every other week. It’s what the other half knows! You can opt in at WorkingRE.com. John Lifflander, ASA, is a Certified General Appraiser in Washington and Oregon. He teaches appraisal courses and has been published numerous times. He is the author of Fundamentals of Industrial Valuation, a textbook for industrial appraisers published by IAAO (International Association of Assessing Officers). He is a former administrative law judge for property tax appeals for the Oregon Department of Revenue and specializes in providing expert witness testimony and consultation for complex valuation litigation.